Thermal drill with rotating drill blades. A mole-like thermal drill designed to cutthrough the icy surface of Jupiter?s moon Europa could be on a future missionslated for launch in 2020. Sucha device would represent the best of both worlds by using heat to melt throughthe ice and rotating drill blades to clear away rocky material. The drill wouldbe nestled inside a larger penetrator probe that would burrow itself into Europa's icy shell. "Penetratorsare the most feasible, cheapest and safest option for a landing on Europatoday, and the knowledge to build those is there," said Peter Weiss, apost-doc now at the National Center for Scientific Research (CNRS) in France. He and his colleagues at the Hong KongPolytechnic University worked with other researchersat the Institut fuer Weltraumforschungin Graz, Austria on a study detailed in the January issue of the journal Advancesin Space Research. NASAand the European Space Agency (ESA) have teamed up on the Europa Jupiter SystemMission (EJSM), with both Russia and Japan also showing interest. The mission could becomposed of several orbiters peering down at Europa, but Russia has its eyes on a possible lander ? and the Russians have already built penetrators forpast missions, such as the failed Mars 96 mission. Anylanding probe that wants to search for signs of life on Europa must go deeperthan two meters into the surface ice, because heavy radiation and particlebombardment would have erased any biological traces in the top layer. Havinga robotic lander make a soft landing before preparing to drill would be a morecomplicated and expensive task compared to a penetrator, Weiss said. A thermaldrill could simply deploy from the side of the penetrator after impact, andbegin drilling through the pristine ice below to sample material at depths ofup to 10 meters.? Estimatesfor the thickness of Europa?s ice shell vary between a few kilometers and tens ofkilometers, but Weiss says it doesn?t make sense to go much deeper than 10meters because of the current state of technology.? For instance, the drill would be tethered to thepenetrator by a communicationcable, and the length of cable would be limited based on how much the probecould carry. This cable would allow data collected from the drill to snake backto the main scientific instruments in the penetrator, and then the data wouldget beamed up to an orbiter. Labexperiments showed how a thermal drill design fared much better in dealing withthe combined challenge of ice and regolith, as opposed to a melting probe suchas the Cryobot that relies upon heat alone. 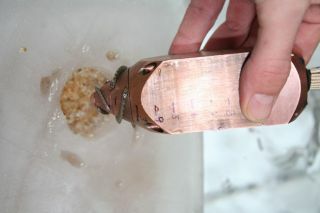 Innerpressure inside the hole is expected to increase and allow for liquid water oncethe initial borehole has refrozen. That would allow the drill to sample waterby using a micro-pump, but the refreezing hole would also protect the pristineice against possible contamination from the outside. Someconcepts of a submersible exploring the supposed ocean depths of Europa haveappeared in past years, and NASA has tested robotic subs in the frigid lakesof Antarctica. ButWeiss, who draws upon several years working with sub-sea robotics, said thatcurrent technology cannot deploy a submersible on Europa. Just packing in allthe cabling that would connect a submersible to the main landing craft wouldrepresent a problem.? Whilethe ice shell is thought to be at least several kilometers thick, no one knowsexactly how far down the ocean may be — there could be a thick layer of slushbetween the ice shell and ocean.? Another question is the distance down to theocean floor. "Theocean beneath — if existent — could be 100 kilometers deep," said Weiss. Roboticsubs on Earth have reached ocean depths of 11 km (6.8 miles), but weighedseveral tons and required huge surface support ships. That doesn't work for a missionto Europa that needs to travel light. "Institutesthat pretend to develop sub-sea robots 'to explore the bottom of Europa?socean' should be financed by Hollywood, not NASA," Weiss said. Theresearchers have so far tested their drill in both pressure and vacuumenvironments, but still want to boost its efficiency. A next logical step mighttest how well a thermal drill survives impact aboard a penetrator. Whetheror not a thermal drill or any sort of landing probe gets a shot at Europa's icysurface remains up in the air. But even as the different space agencies figureout their roles and budgets, Weiss says there?s a sense of urgency to find outwhat's going on with Europa. Amission that consisted of only orbiters might find more interesting evidencethat supports the possibility of life on the Jovian moon,but would not have the ability to go down and find proof. And a follow-upmission might not even launch until the 2040s — good reason for the currentgeneration of scientists to want some surface explorer element. "Otherwise,we won?t have any confirmation on astrobiology on Europa — or maybe even in thesolar system — during our lifetime," Weiss said.